Nearly all DVD extras — commentaries, new interviews, archival footage — consist of filmmakers and performers praising the film in question. It’s thus very rare indeed to see the sort of brutally honest, and very funny, interview found here, where the star (Chris Elliott) and director/scripter (Adam Resnick) of this 1994 cult movie convey their misgivings about the picture, chronicle its troubled shoot and speak quite candidly about how the picture stalled their career and lost them jobs for years afterward. 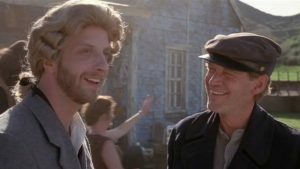 The truth about Cabin Boy, though, is that it is a really funny film that is also incredibly uneven in terms of production values and its pacing. It was certainly destined to be a cult movie because of what it is — a spoof of Captains Courageous (1937) and the fantasy films that featured the animation of Ray Harryhausen. Chris Elliott’s humor has never been a mainstream taste, and the work he did with collaborator and friend Resnick — on the Letterman show, Get a Life, and here — was esoteric and eccentric on purpose, with a large dose of the “how clueless can Chris’s character be?” factor. The restoration done on the film for this release underscores the low-budget nature of the special effects, which surely adds to the film’s cult appeal. Its bizarre plot finds a spoiled rich boy (Elliott) blundering onto a scummy fishing ship with a grizzled crew called “the Filthy Whore” and encountering various mythological creatures on the open seas and a deserted island. The picture was most certainly aimed at fans of Elliott’s off-kilter humor on the Letterman show and viewers who had some familiarity with the material he and Resnick were spoofing. The film’s first release on DVD, from Disney/Mill Creek in 2002, had no supplements at all. This deluxe edition from Kino Lorber Studio Classics contains the vintage materials that should have been on the earlier release, plus new items recorded for this edition. The vintage extras are all of the “electronic press kit” variety. B-reel footage from the set, audition tapes of Melora Walters (The Lovers) and Andy Richter, and on-set interviews with the cast members all hail from the pre-release days when there was enthusiasm for the film, based on the involvement of producer Tim Burton and Elliott’s celebrity from his time on the Letterman show. Six minutes of outtake footage show a wisely deleted scene featuring Chris on his own — those seeking additional footage of supporting player Ann Magnuson (Love at Large) and the barely-present cast members Ricki Lake (Last Exit to Brooklyn), Russ Tamblyn (West Side Story), and (an uncredited) Alfred Molina will have to look elsewhere. The supplements created for this release are the most fascinating part of the package — most prominently the aforementioned 45-minute onscreen interview with Elliott and Resnick, which takes viewers through every (cursed) step of the production and release. The former co-writers — whose wonderfully weird collaborations sadly ended with Cabin Boy — discuss at length how the film was conceived of as a project to be directed by Tim Burton, who had expressed interest in working with Elliott. They note that the script they came up with was “tailored” specifically for Burton’s involvement and was not something they would’ve pursued on their own. They recount their amazement at how quickly the project was green-lit and then how Burton suddenly dropped out as director (to work instead on Ed Wood), instead serving as a very hands-off producer. Resnick reminisces at much length as to how he didn’t have any desire to direct the film but was thrust into that role. At the same time, the budget was reduced, to the extent that many scripted scenes requiring special effects were dropped and the ones that remained ended up looking extremely artificial and tacky. The most interesting aspect of this interview is indeed how negative Elliott and Resnick are about the film. At various times the pair seem to be in competition as to who can trash it more. All the stories Resnick tells about being informed by the studio that he’d have to “dump” a particular scene, and the anguished details about the disastrous previews screenings, are put into a more encouraging context at the end of the interview when both men admit that, to their surprise, the film began to acquire a cult following in the early 2000s, made up of viewers who had no idea it was such a critically drubbed flop. The audio commentary that Elliott and Resnick recorded with writer Mike Sacks plays like an extended version of the onscreen interview. This time out, though, the pair frequently end up inquiring what’s going on in the picture, as they haven’t watched it since it was initially released. The discussion of the film’s 21st-century cult following does much to balance out the pair’s bad memories of its critical and public reception. The best part of the commentary occurs about midway through, when both collaborators go back to what they thought of the film when they were conceiving of, and shooting it — that it was intended to buck the comedy movie trends of the Nineties (Ace Ventura was a box office smash around this time) and got unnecessarily panned, most likely for just being too weird and outré for its time. After listening to Elliott complain about the picture for so long, it is indeed refreshing to hear him defend it in this way. He even evokes the name of a fairly terrible comedy of the same period that received only cursory abuse from critics and played to its specific fan base, only to quickly disappear onto home video. 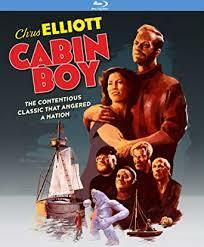 Cabin Boy is indeed very imaginative while being dumb in a very smart way — much more so than the picture Elliott cites as getting a pass from reviewers and the public, the Pauly Shore vehicle Bio-Dome.